I was really excited when i received this superior hair mask. Having used hair masks before they are a must have in my hair care routine. that will hopefully maintain and improve my hair health. This hair mask comes in a red packaging box that matches the coloured scheme of the the actual hair mask pot. The amount you get is 240ml which is 8 FL OZ which is pretty good and this is more than u get in any other hair mask pot. The lid screws off easily and you are presented with the hair mask that is like an almost light coloured milky coffee colour. This mask has a slight scent which smells divine like a citrus forest and has a thick consistency but doesn't feel heavy when applied. What got my attention about this product is that its stated SUPERIOR HYDRATION which anyone who uses heated styling tools or colours there hair all the time, we are looking to put moisture back in that these factors play a part in taking out. 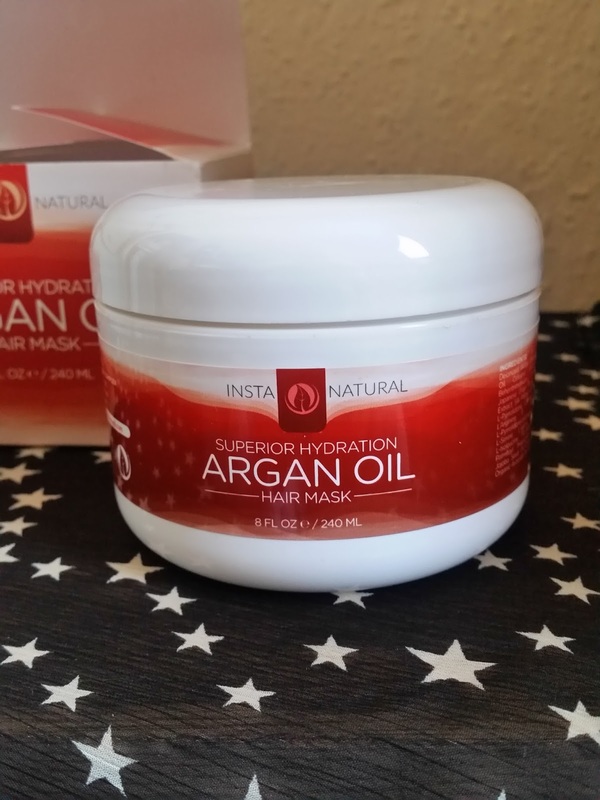 InstaNaturals Argan Oil Mask is a deep conditioning treatment designed to transform dry and damaged strands into soft,shiny, healthy hair. Its restorative ingredients - such as Argan Oil, Japanese Green Tea, Amino Acid Complex, Coconut Oil, Shea Butter, Jojoba Oil. Work together to penetrate hair deep down and deliver ultimate nourishment and help hydration to enhance texture and shine. This intense blend full of organic ingredients also serves to strengthen hair to defend against heat damage and other external aggressors. Apply hair mask to clean towel-dried damp hair. Use your hands and fingers to evenly distribute generous amount beginning at the scalp and working towards the ends. Leave treatment in for 5- 15 minutes and then rinse. Use once or twice a week. Having used Argan oil masks before and seeing little benefit, i was a bit sceptical when i received this. I'm actually glad i received this as i was colouring my hair the same day it arrived and had run out of my usual hair mask. When it came to using this product and my hair was needing a treatment by then, i was amazed at how well this product glided through my tresses with ease. Also you don't need to use a lot to cover your hair ( my hair is shoulder length ) and a ten piece sized blob is enough! When this product was applied i wrapped a warm towel around my head ( using a warm towel opens the hair cuticle for the product to penetrate) and waited a good 30 minutes. I could feel this mask soothing my scalp and helping my hair back to its former glory. The time came to wash this lovely mask off and instantly my hair felt smoother through this process. This product washes out really easily and there's no residue left on your hair and no sticky feeling that u can get from other products that just leave a temporarily film to make your hair appear healthy, when in fact its not. My hair felt instantly moisturised and i could run a comb through with no snags or knots! Drying time was made easier and the time took less then usual. 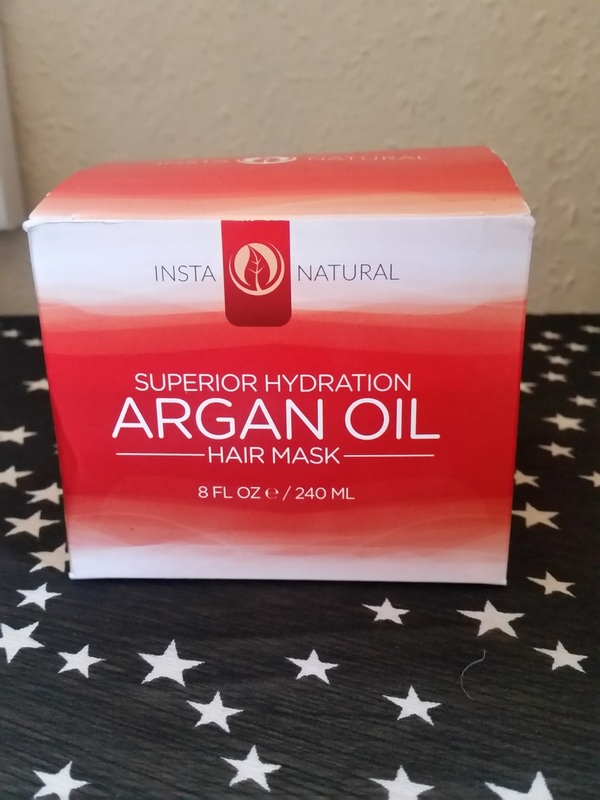 InstaNatural Argan Oil Hair Mask makes your hair look healthy, shiny and more manageable. You can do whatever you like with your hair from using colours and styling tools without feeling guilty, as long as you have this in your hair care routine. This mask opened my eyes to what i thought other masks were helping with my hair health, they were not! They were just leaving residue on the hair to coat it and once that residue was washed away the problem was back. 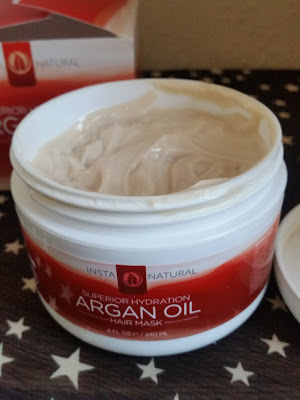 So if your looking for a hair mask i would highly recommend the InstaNatural Argan Oil Hair Mask. This mask works and keeps working every time you use it! I have been converted and this is my number one hair mask and hair saviour!